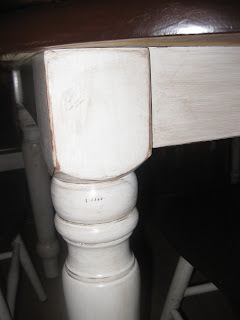 Una Mamma Italiana: My Kitchen Table Project: Refinishing a wood table from Craigslist! 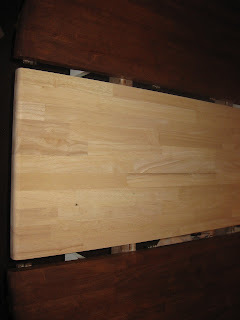 My Kitchen Table Project: Refinishing a wood table from Craigslist! 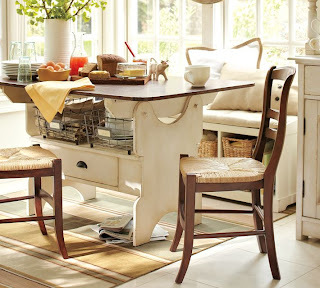 For Italians (and humankind, I''m sure) the kitchen table is where EVERYTHING happens! 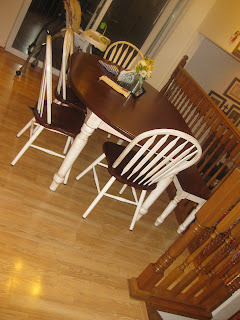 Since my hubby and I got married we have had two kitchen tables - both of which were hand me downs from my parents. And boy were we grateful to get them! But they were never what we would have picked for our own home. We could eat on 'em - so it fit the bill! When I finally got fed up with my current hand-me-down table being too big for our tiny eating area, I HAD to do something! S0 I did a little Craigslist shopping (after a LOT of online shopping.......er, dreaming) and found a steal of a deal! There was a SOLID WOOD table and five chairs. We swept it up for $85 and were thrilled to start working on it. Well, at least that's my side of the story. 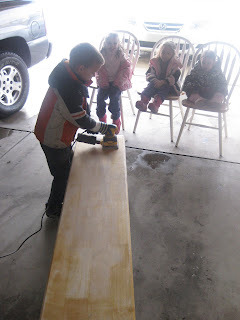 Then he was miraculously super excited to use his new power tool and started sanding. I didn't even have to ask him!!! I was pretty excited that I didn't have to do the hard part! But the KIDS DID!!! 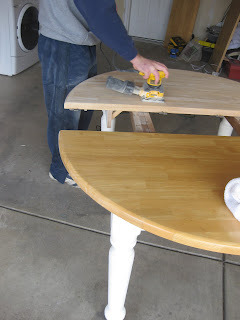 So after a good sanding down to the bare wood - we picked out our stain and went to town. One day, I will eventually get wood colored chairs, and get rid of these spindle ones ( I secretly HATE them) but for now I stained them to match. Also, the bench I already had from a previous Craigslist purchase!!! So I just stained it to match! Now it looks like a set. Since it was FREEZING out, I stained the entire thing in my living room! I used water based polyurethane to avoid the strong smells. And after looking at it, I wanted the white legs to be a little more aged. But I was afraid of crossing the fine line between dirty and rustic. SO I employed the help of my artistic friend and had her teach me some faux glazing! IT was a blast and I learned A LOT about how to get it looking rustic. 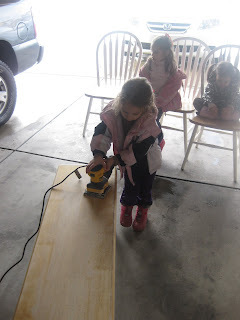 Most of all - it was a FAMILY project that we all remember every time we gather around the kitchen table. Whether we're eating or doing homework, we are constantly reminded that we did this together! Now, we are no professionals, but we are excited to tackle more projects like this in the future! 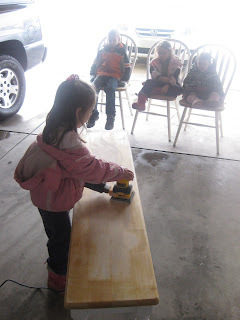 We learned so much of what to do and what NOT to do just on this table. Which is fine with us because our mistakes will likely be covered up by the ABUSE this thing will get from my five bambini! Homemade Chapstick - a.k.a "Mamma's Mintstick"